McCaul, who has not ruled out challenging Cruz in 2018, has previously dinged Republicans for not supporting Trump. But in a radio interview Tuesday morning, McCaul expressed a new level of condemnation for the Trump holdouts in his party, calling their non-endorsements "unconscionable," saying there will be a "high price to be paid" if Democratic nominee Hillary Clinton wins and claiming they are only interested in attention for their anti-Trump views. McCaul did not spare Cruz, who caused an uproar at the July convention when he delivered a prime-time speech expressing no support for Trump, his former bitter rival in the primaries. "I think what he did at the convention turned off a lot of people," McCaul told host Laura Ingraham. "I mean, he pledged to support [Trump]. He broke his word." Cruz has argued that the pledge he and other primary hopefuls signed last year was "abrogated" when Trump went after his family, retweeting an unflattering photo of his wife and giving voice to a false rumor that Cruz's father was involved in the John F. Kennedy assassination. Cruz's convention speech has drawn comparisons to that of Ronald Reagan in 1976, when Reagan made impromptu remarks at his party's gathering after losing the nomination to Gerald Ford. Reagan's speech then was seen as laying the groundwork for his successful presidential campaign four years later — and some Cruz fans hope the same will apply to 2020. McCaul, who is advising Trump on national security issues, seemed to dismiss that theory Tuesday. McCaul suggested that Reagan, unlike Cruz, was ultimately a team player in the 1976 election, which Ford lost to Democrat Jimmy Carter. "That's what made him magnanimous," McCaul said of Reagan. "That's what made him a contender for the next election cycle." Asked for comment on McCaul's criticism, Cruz's team reiterated his official position on the presidential race since dropping out, which is that he is monitoring developments but definitely not supporting Clinton. "The election is ongoing and as Cruz has said many times, he continues to watch and listen to the candidates, just as all Americans are doing," Cruz spokeswoman Catherine Frazier said in a statement. On Friday, Cruz told The Texas Tribune he was not taking his re-election for granted but was encouraged by the support he has in his home state. Lt. Gov. Dan Patrick, who has expressed disappointment with Cruz's decision not to back Trump, said in another radio interview Tuesday that he nonetheless thinks Cruz is "secure for his Senate seat" in 2018. Asked again by Ingraham whether he was thinking about taking on Cruz, McCaul reiterated that his current focus is on helping get Trump elected. "I'm putting the country first," McCaul said, "above myself." U.S. Sen. Ted Cruz, R-Texas, declared Friday that the GOP majority in the Senate is in serious danger and warned Texas Republicans in particular against staying home in November. 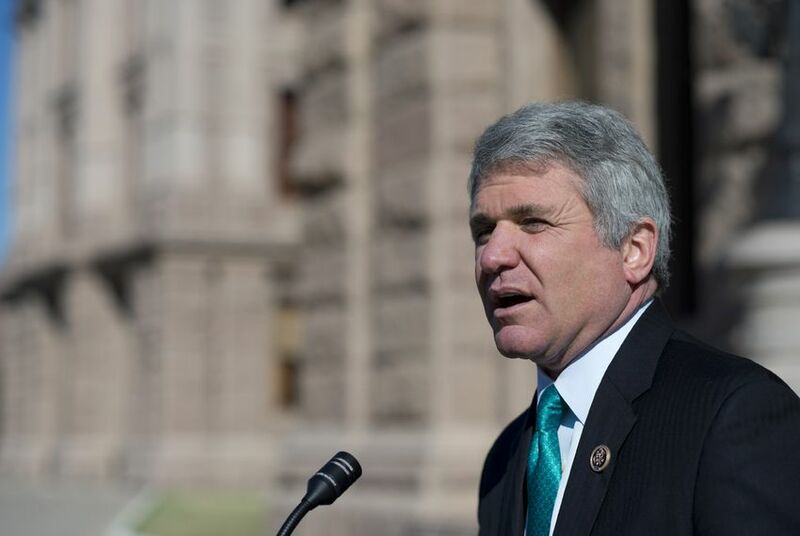 In August, U.S. Rep. Michael McCaul didn't rule out challenging U.S. Sen. Ted Cruz, in 2018, but he's emphasizing that he is not focused on it for the time being.